Nothing beats a fireplace when it comes to creating warmth and ambiance in your home, whether in the dark days of winter or the occasional chilly night year-round. While the fireplace has been a symbol of warmth and comfort for ages, the technology behind this centerpiece of the home has greatly improved. The traditional wood-burning fireplace, with its problems of energy efficiency and cumbersome use, is no longer the only option. A modern gas fireplace with a stone surround. Gas fireplace units, in the form of gas-log inserts and vented and unvented systems, have become a great, clean-burning, energy-efficient alternative. While they share all of the strengths of a traditional wood-burning fireplace, including the beauty and comfort of a flickering fire, gas fireplaces have improved on this technology, providing a way to conserve energy, live greener, and reduce heating costs. At gasfireplaces.org, we are here to provide you with all the information you need to make an informed decision when it comes to choosing the right fireplace for your home. A gas fireplace between 2 rooms. Why should I install a gas fireplace? Here are five simple reasons why. How does a gas fireplace work? What are the advantages that a gas fireplace holds over a wood-burning fireplace? What kind of gas fireplace systems are available? Which one is right for me? 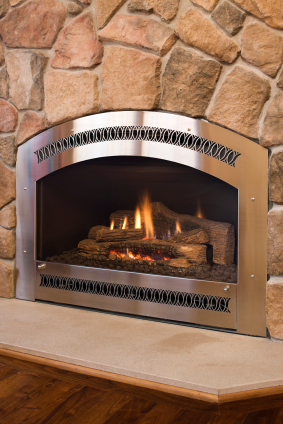 Ventless Fireplaces do not need a chimney or a vent! They can be installed anywhere, without the tedious task of making external structural changes to your home. They use a system much like a gas stove, performing at nearly 99% energy efficiency, since all of the heat is released directly into your home. They are extremely reliable, with built in air quality detectors that automatically turn the system off depending on oxygen levels. Gas Logs are used in both kinds of systems. There are countless varieties sure to match the style and feel of your home. I want a gas fireplace.What are the steps to get one? What do I need to get my gas fireplace set up? How Much Does a Gas Fireplace Cost? We tried to break this down the best way can. Into cost of the fireplace, cost of additional components, and the cost to operate. How do I keep my gas fireplace clean? Gas fireplace units are much easier to keep clean than the sootiness of wood-burning systems. 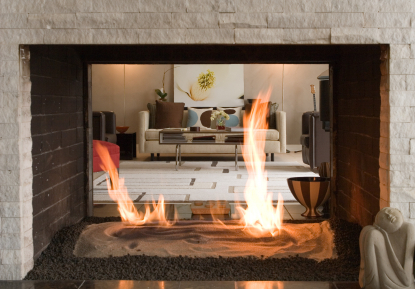 Here are some tips to help your gas fireplace running smoothly. Where can I find gas fireplace providers? You’ll find links and resources for gas fireplace manufacturers and installers here. I still have some questions about Gas Fireplaces. Have no fear, this section is just for you. Look at our FAQs or ask your own question.